Just whipped up Katie180’s Chocolate Carrot Slice (if you don’t follow this chickita, you should! She’s straight talking and hilarious), check it out! 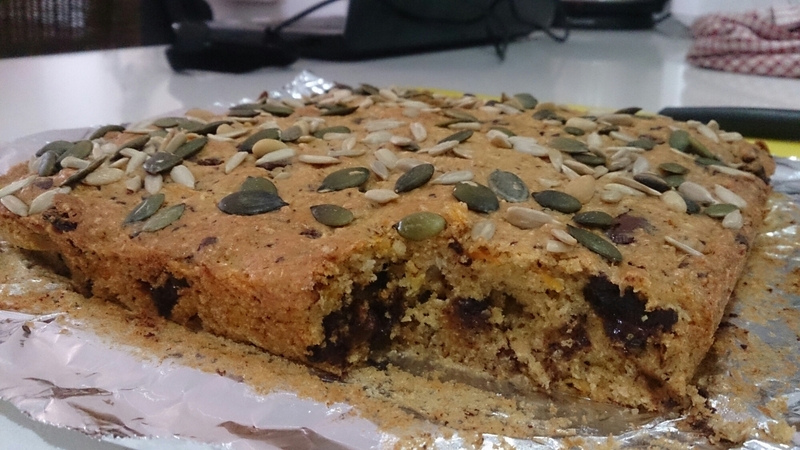 Massive kudos to Katie on this one, it is one of the simplest and most delicious, (semi) nutritious slice recipes going. I used a cup of wholemeal SR flour instead of half spelt, but I reckon it would be better with the spelt. If you’re not keen on using sugar and butter, you could substitute the sugar for honey or other alternative sweeteners, and the butter for nuttelex or possibly olive oil (whether oil would work I’m not sure). I used nuttelex and Old Gold dark chocolate for mine and it turned out a bloody treat! Also topped it with pepitas and sunflower seeds for extra goodness. ← Apple Pie Porridge makes for a gooooooooooood morning!